Wednesday, April 10, 2019, 6:00 p.m.
Dion Lim (林迪安) is a TV news anchor and reporter at ABC7/KGO-TV in San Francisco, CA. She has made her mark as a minority climbing the competitive TV news ladder starting as a reporter in small-town Springfield, Massachusetts to mornings in Kansas City, and later as primary anchor for stations in Charlotte, North Carolina and in Tampa Bay. Until the San Francisco Bay Area, she’s been the first Asian American woman to ever hold a full-time anchor position in each television market. Dion stands apart as a professional journalist for her willingness to share her own stories with viewers and readers, as well. A sought-after speaker and emcee, she has hosted events with everyone from news legend Dan Rather to Hollywood celebrities like Patrick Dempsey and community groups, such as a leadership summit of 600+ attendees for immigrant women. She has contributed to the Huffington Post by Arianna Huffington’s personal invitation and has also written a series for Amy Poehler’s Smart Girls. She has been named one of America’s Top 18 Leaders in TV Under 34 by Broadcasting & Cable Magazine. This year she was featured in Glamour Magazine for her on-air style. In her new book, The Communication Playbook (Mc-Graw Hill, September 2019), Dion will share her stories — and the crucial lessons for women that she has learned along the way. 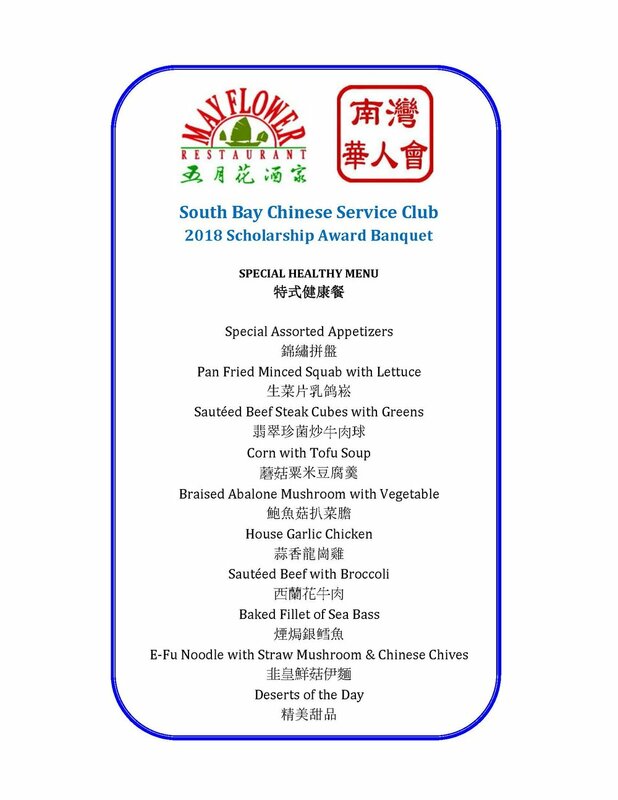 This year, the Award Banquet will be held on April 10th, Wednesday evening at the Union City Mayflower Restaurant (34348 Alvarado-Niles Rd., Union City, CA 94587). The dinner banquet program will start at 6:00 p.m. and is expected to finish no later than 9:00 p.m. Please arrive 15 minutes earlier to check in so that we can start on time. RSVP Deadline was 4/1/2019. We are no longer accepting reservations online. Please contact Aliene Yee or Cecilia Leon for more information. All scholarship student applicants will receive complimentary dinners. This year's major donors (donations of $125 and up) will also receive complimentary dinners to this year's award banquet. If you have not made a donation but would like to make a donation now, you may click on DONATE to go to the Donation Page to donate with your credit card. For those receiving complimentary dinners and have not made their reservation yet, please contact Aliene Yee or Cecilia Leon directly to inquire about possible availability due to potential cancellations as this event is now sold out.